Initially, I headed over to Le Fournil hoping for a galette des rois, the traditional French cake served on the Epiphany and for several days after. Alas, not a galette was to be found at this traditional French bakery, but it wasn't a complete wash--I picked up one of their gorgeous-looking chocolate tarts. The chocolate tart (or, if you're feeling Frenchy, the tarte au chocolat) is comprised of a brebaked sweet pastry shell filled with the most divinely rich chocolate ganache--this stuff is so dense and decadent that it will leave teeth-or-tine marks when broken apart--just like the inside of a decidedly rich truffle. I'd like to say it's suitable for sharing, but I know that personally, I'd rather not, instead opting to eat this in lieu of dinner. How could it be wrong when it feels so right? 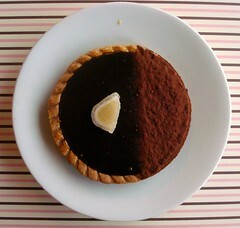 The Tarte au chocolat is available at Le Fournil.